Our long-standing regular customers include the world’s largest poultry farms and meat factories. Our reference list can be downloaded in PDF format. Agrovo* has been in existence since 1994 and its headquarters are in Vienna, Austria. Since our establishment, we have been specialising in the supply of machinery and technologies to large poultry farms and meat factories. We have been the sole agents of the Dutch group Moba for the CIS states since 1997. The Moba Omnia range of egg grading and packing machines is designed to perfectly match the steadily increasing requirements of the egg industry. By using and incorporating ideas and demands of our customers continuously, the Omnia range is built to your needs. With an impressive market share world-wide, the name “Omnia XF” is well known in the egg industry. It is by no means a synonym for “a grader”, but it stands for a versatile modular system, from which you can compose the optimal configuration for your individual situation. The Omnia XF series covers capacity ranges from 30,000 eggs/hour up to 120,000 eggs/hour (85 up to 330 cases/hour). Equipped with the world famous individual egg handling technology the Omnia XF series combines the best possible egghandling with maximum efficiency and full traceability. In Omnia FT the infeed system is a true revolution. A robust and very open construction holds a cleaning in place system for all rollers and additionally allows high pressure cleaning. The very open construction without dirt-traps keeps areas where dirt can accumulate to the absolute minimum. The Moba 2500 is the ultimate solution for a modern, simple, reliable and economic egg grading and packing machine. Being a perfect combination of reliable, proven principles and modern technology, this machine provides you with years of worry-free egg grading. These properties, with the combination of simple plastic and stainless steel construction, make the Moba 2500 the ideal egg grading machine for small and medium businesses. Equipped with the world famous individual egg handling technology the Moba 2500 combines the best possible egghandling with maximum efficiency. The Prima 2000 is a reliable, economical no nonsense machine. The Prima 2000 is a stainless steel egg grading and packing machine with a capacity of 20,000 eggs/hour. A machine with a relatively low investment price but by means of an Upgrade Kit, the Prima 2000 can be expanded to become a full Moba 2500 (30,000 eggs/hour) so your machine can grow together with your company needs. Equipped with the world famous individual egg handling technology the Prima 2000 combines the best possible egghandling with maximum efficiency. Moba’s low-volume Graders are a vital link in the world’s egg industry. A large part of the worldwide egg industry depends on Moba’s fully automatic, high-capacity grading/packing systems, which process up to 190,000 eggs per hour. However an even important part of the global egg business relies on smaller scale operations. Smaller scale but with similar demands for reliability easy maintenance efficiency and profitability. In this field, too, Moba is the acknowledged leader. Tens of thousands of these hand graders are serving farmers around the globe – many for dozens of years. Mopack Farmpackers are designed for your profit. High performance machines with net capacities close to the theoretical maximum coupled with well built robust designs. Their low-maintenance technology with their hygienic and easy to clean construction makes these farmpackers reliable and hard working companions for many years to come. On farms without grading capacity, the eggs must be prepaired for transport by putting them on trays. Moba Farmpackers have the reputation of doing this with great care and at high speeds. The "gentle touch" philosophy is even found in these smart machines and once the eggs are in the farmpacker, they will never have contact with the other eggs and are handled individually. Mopacks are constructed of stainless steel, are easy to clean and have as much equipment above the eggflow as possible thanks to the track system. The result is optimal performance and the best product treatment that can be offered. The Mopack 150 combines the traditional virtues of continuous movements with the capacity advantage of packing 6 eggs in one cycle. Where traditional packerhead construction wait for the 6th eggs the Mopack 150 ensures the availability of 6 eggs at all times, so there is no need to wait at all. This results in a continuous movement that combines excellent egg handling en high capacity. The Mopack R is a stainless steel machine which can pack eggs in to consumer packs and trays with a maximum capacity of 30,000 eggs/ hour. The machine can be configured as inline”, directly processing eggs from chicken houses. In another configuration this machine can be equipped with a loader, and with that configuration the Mopack R is capable to pack eggs from trays into consumer packs. In the market these type of machines are often called “Repackers”. The design of the machine is based on the sophisticated and reliable equipment of the Moba Mopack 100. The machine has a well built robust design and has low maintenance technology with its hygienic and easy to clean construction. This makes the Mopack R a reliable machine which will last for many years and is designed for your profit. In 2010 Moba teamed up with Motoman, a Yaskawa subsidiary and global leading supplier of industrial robots. A partnership with a strong and global operating company was a must for Moba to meet the long term commitment to our customers, securing availability of service and parts for many years. 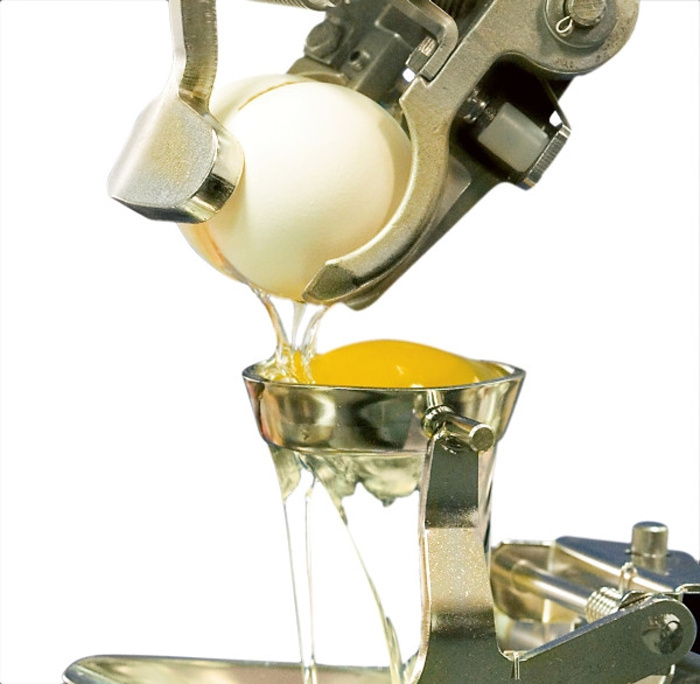 With a portfolio of more than 175 different types of robots, the best possible types could be selected for the specific tasks done in the egg industry, resulting in the Moba Robotics (MR-) series. The MR 10 is specifically designed to pack consumer packs and trays into cases or crates and can be connected “inline”, that is directly behind a block of packing lanes of an egg grading machine, or “offline” via a logistic conveyor system (Contiflow). Depending on the type of egg pack, the capacity of the MR 10 can vary from 30,000 (80 cases) up to more than 40,000 eggs (110 cases) per hour. As a rule of thumb approximately 12 cycles per minute can be calculated, resulting in a basic capacity of approximately 35,000 eggs (97 cases) per hour, based on 48 eggs per packing cycle. The MR 20 packs consumer packs or sealed trays in- or onto displays or shippers. It can be connected behind the egg grading machine in a limited number of configurations, but will mostly be connected offline, through a conveyor system such as Contiflow, away from the egg grading machine. Depending on the type of egg pack the capacity of the MR 20 can vary from 25,000 up to more than 40,000 eggs per hour. The capacity depends on the number of strokes that is needed to form a single layer, but also on the number of layer pads that is used. As a rule of thumb, one can count with 7.5 cycles per minute. This results in a basic capacity of approximately 36,000 eggs (100 cases) per hour, based on an average of 80 eggs per stroke. The MR 30 is a smart combination of the capabilities of MR 10 and MR 20 into a very flexible application for further automation of your packing station. This robot can be set up either as case packer or as a display loader. Since the dimensions of the MR 30 are the same as the MR 20, it can only be connected inline, that is behind the egg grading machine in a limited number of configurations and will therefore mostly be positioned offline, that is away from the egg grading machine. The MR 30 can be equipped with all options that are also available for the MR 10 and 20. MR 40 Tray Palletiser is a system which automatically places a row of stacks, 6 trays each on a pallet. The MR 40 is capable of palletizing stacks of trays coming from 1 or 2 farmpackers or packing lanes from an egg grading machine. It has a max capacity of 108,000 eggs (300 cases) per hour and can process both plastic and paper trays and stacks on wooden pallets with cardboard layer pads, as well as on the Egg Cargo System (ECS). MR 50 De-Palletiser is capable of de-palletizing pallets of the Eggs Cargo System(ECS) and has a maximum capacity of 180,000 eggs (500 cases) per hour. It can be connected to Moba loaders with a continuous running pre-loader belt such as for example the TVS 60, TVS 120, FL 330 and FL 500. The MR 60 Case Palletiser is capable of palletizing cases and crates filled with consumer packs. Consumer packs can be put in cases or crates by manual loading, or by automation through case packers of the CP or MR-series. These cases can be stacked on pallets for transport to the retail or distribution centre. The brand new innovation in the Moba Robotics series is the Twin Case Packer MR 12. With its 2 independent robots and the Flexgripper the MR 12 offers the key to the most efficient way of case packing combined with the best possible egg handling. All functions are implemented in a very compact enclosure. The MR 12 is a Twin Case Packer robotic system especially designed for the high demanding market in the egg industry. A special and unique feature of the MR 12 is the ability to process 2 independent products. Both channels of the MR 12 can operate independently what makes this system very flexible. By using both channels on different grades, a very high and constant throughput in relation to floor space can be reached. The Maxipack is an automatic chicken bagging machine for both frozen and fresh end products. Like all Moba machines, the Maxipack has been designed and built for ultimate reliability and minimal maintenance. Parts are made of stainless steel and high-quality plastics. All sensitive components are well shielded, so the entire machine can be cleaned with high pressure. Although the capacity of the machine is over 1,100 cycles per hour, the human operator limits the Maxipack to a realistic output of approx. 800 birds/hour. The output depends on the local conditions, such as bag and tape quality, and the organization around the machine. Eggyplay is a brand –new egg box design that serves two functions: in addition to storing and protecting eggs the box can be reused as a toy. An exciting new egg box design. Eggs have never been sold like this before: in an egg box specifically targeted at families with children. The new eggplay boxes from Egg Posure are completely unique and will certainly attract a lot of attention – both in stores and at home, where they will allow children to let their imagination run free. With eggyplay boxes they can build large, colourful houses, castles bridges and much more. This is a truly value-adding egg box that gives children hours of entertainment. Safe, colourful and fun! The new eggyplay boxes are completely child-friendly. Made from environmentally friendly moulded plastic, the boxes interconnect and can be safely stacked like building blocks. Each box contains 8 eggs and fits eggs in sizes S, M, or L. The boxes are available in four different bright colours. Each pack contains all four colours. Eggs contain all minerals and vitamins (except vitamin C) as well as masses of proteins of the best kind. Their nutritional value and the learning aspects of construction play both underscore this concept’s suitability for children. Kuhl Corporation is a family business currently in its third generation. Founded in 1909, Paul H. Kuhl built this business on the basis of quality, precision, and innovation. This strong foundation has enabled Kuhl Corporation to strive for nearly 100 years. Kuhl Corporation has established itself as a leader within its industry, as well as, one of the leading manufacturing firms in the United States. Kuhl Corporation is the only remaining family business in the poultry manufacturing industry. First founded by Paul H. Kuhl, Kuhl Corporation progressed substantially through the hard work and determination of his two sons Paul R. and Henry Kuhl. Though they are still very actively involved in the daily operations, Kuhl Corporation is now in its third generation of family operation. Jeff, Kevin, and Rick Kuhl continue to build upon the strong foundation in which Paul H. Kuhl had founded this business upon. Kuhl Corporation has become the world’s largest manufacturer of poultry plastic equipment, as well as, the world’s leading innovator in commercial washing equipment. This wide ranging product line has enabled Kuhl Corporation to not only become its industry leader, but also endure the test of time. Based on the proven LEXMARK ink jet print head, OLYMPUS OP12 Inkjet delivers bold, fully formed characters from the first print to the last with a full 300 DPI at production line speeds of up to 61m per minute. OLYMPUS OP12’s compact and ergonomic design allows it to be sited in almost any production facility. Product family compatibility means that OLYMPUS OP12 can directly replace or complement other Rational marking systems as well as offer low cost, low maintenance coding to new customers. Built in to the print head is a 42cc ink reservoir. Once the ink in the cartridge has been depleted, it can be taken out, disposed of and a new ink cartridge inserted in seconds. Rational’s dedicated software can control up to 32 inkjet or thermal printers with any mix on the same system. Variable traverse speed on single and twin moving heads – Up to 40m/per min. 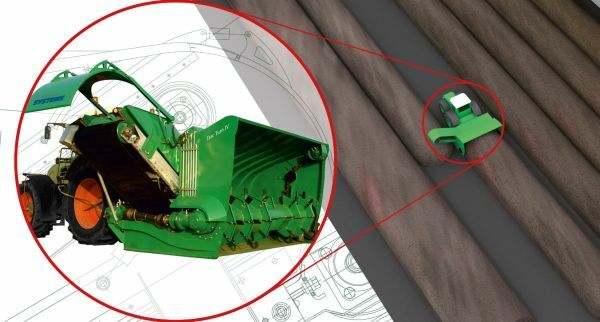 AGROVO is representative of the Austrian "Compost Systems" company, which has been working for more than 25 years with the technological development, and delivery of equipment for further processing of manure. More than 70 plants worldwide have realized the offers from Compost System confirming thereby that these technologies actually work. The processing of egg products includes breaking eggs, filtering, mixing, stabilizing, blending, pasteurizing, cooling, freezing or drying, and packaging. The term "egg products" refers to eggs that are removed from their shells for processing at facilities called "breaker plants." In the egg processing business, it is absolutely vital that the complete egg-breaking process is focused on getting the best possible end product. Proper pasteurization of the egg products is very important for achieving this, but the whole process needs to contribute to the all important factors such as shelf life and functional properties. Keeping the bacterial load of the product as low as possible right from the start should be the ultimate focus. We offer a full range of Processing Factory Systems with modular design for both whole egg and separation plants. The modules are built on skids and are foreseen of all cabling, piping and automation before shipping. Our Factory Systems are designed for minimal manual intervention to avoid human error, loss of product and to make optimal use of all resources. All components are selected and designed to minimize mechanical and temperature stress on the product. We propose a CIP system with maximum recycling of water and chemicals allowing for important operational economies – ultra compact system with 3 tanks in one. The combination of gentle product handling and optimal CIP processes allow us to offer end products with a long shelf life and great functional properties. All our designs of piping, tanks and components are in line with the cGMP, USDA et EHGDG regulations. The automation architecture is the basis of the modular concept and provides centralized management of all programs and recipes as well as centralized information or alarms generated by the instrumentation of the entire processing plant. When in doubt you can rely on remote (internet) assistance. On our various service locations around the world a Moba helpdesk is available. This network of helpdesk is linked together to the Moba headquarters for support if needed. Did you know that over 80% of all emergencies can be fixed via a quick diagnosis over the internet? The graders of the Omnia family as well as Autopack units such as Casepackers and DIsplay loaders are all accesible via an internet connection. The Moba helpdesk is able to see what you are seeing and much more! Via monitor programs almost every sensor input and motor or actuator output can be checked. Many log-systems in the various processors offer our specialist tools for a quick diagnosis, all with one purpose: get your machine running as you want it. First aid in crisis situations is only a small part of the Helpdesk activities. Most of the request concern questions about the operation of the machine. You can compare it with MS-Word that you probably use on your pc to write letters: you use a certain portion of the options but there are much more features available. And what if you want to use a new option and want it on the spot? It is a comforting thought that around the clock specialists are available that can not only answer your questions, but can actually show all needed keystrokes over the internet. 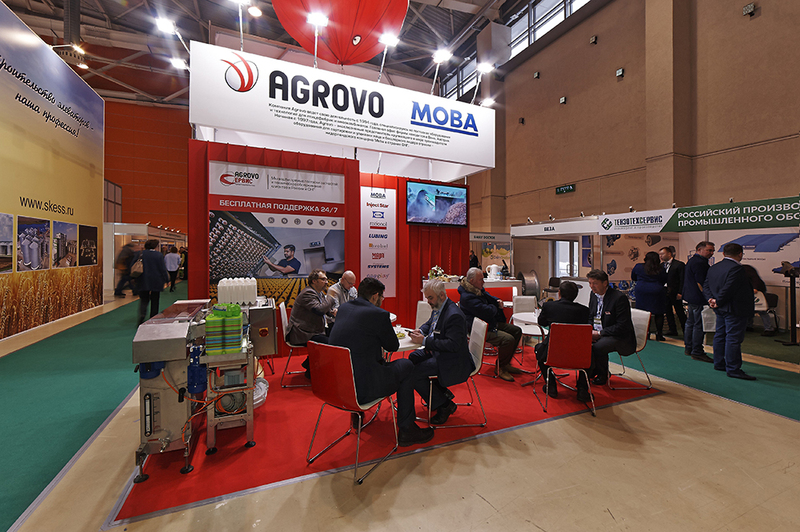 More than 20 years AGROVO is the sole agent of the Dutch group MOBA, the world’s largest manufacturer of egg grading and packing equipment and of machines for packing poultry, for the CIS states. There were installed egg grading machines on the largest farms of Russia, Belarus, Ukraine, Caucasian countries and Kazakhstan during this period. Our company constantly develops the level of technical support and service of the equipment supplied, therefore, to meet the requirements of our customers, and also to raise the level of maintenance, the AGROVO-MOBA Service Moscow Center was established. • the equipment is regularly and systematically served by specially trained personnel in accordance with the relevant technology. • instruction on the operation of the equipment for incoming staff. In addition, we significantly increased our spare parts warehouse, and soon, will be created on-line database of spare parts available from the spare parts warehouse located in Moscow. This will allow our Service Center to eliminate the technical malfunctions of the equipment encountered in the operation in the fastest way. Each egg grading machine MOBA equipped with a modem for emergency communication with the MOBA Service Center. Our Service Center provides support in adjustment of this connection and advises the customer on the results of the communication session with the machine on the basis of conclusions obtained from the MOBA Service Center. Based on the statistical analysis of technical failure of equipment, installed on the poultry farms of our customers, we know that most problems are caused by erroneous actions of the personnel, and also because of delayed and incompetent execution of maintenance work.. We organize special trainings in the MOBA Training Center in order to avoid this negative situation. These trainings are aimed at improving the service quality of equipment by specialists of poultry farms in the shortest possible time, without a long equipment downtime. We are glad to assist our customers in maintaining stable operation of equipment. Our specialists have been trained at the manufacturer of the equipment and have certificates confirming their qualifications. They constantly communicate with developers and technical service of the manufacturer of the equipment and professionally provide technical service using an expensive special tools and fixtures. For the purpose of implementing a full service to our customers we have organized a warehouse of spare parts in Moscow and have installed the automated recording system that monitors the availability of critical spare parts in a warehouse, and also helps to control and predict all deliveries. Considering the needs of our customers we draw up a wide range of the parts required, which are supplied with the stock to our warehouse. Agrovo* has been in existence since 1994 and its headquarters are in Vienna, Austria. complex automation systems for egg packing stations, including the egg collection belts, delivery, unloading, repacking systems, traceability and trackability systems for eggs, from the chicken house to the end user. technological food additives and spices for injection and tumbling of red and white meat. Our long-standing regular customers include the world’s largest poultry farms and meat factories. See list of references. A service centre operates out of our Moscow office and employs experienced and “battle-tested” engineers. We carry an extensive range of spares for the egg grading machines. We have also opened offices in Kiev and Minsk. *The name Agrovo originates from the Latin words ager (field) and ovo (egg). A central event of the first week of October 2015 was the largest international agricultural exhibition "Agroprodmash 2015", which celebrated its 20th anniversary this year. One of the main events of spring 2015 is the international exhibition of innovative technologies for beef and dairy farming, pigs and poultry farming - VIV RUSSIA. New Year's Eve, the time when hopes and dreams come true, was marked in 2014 by a noteworthy event: AGROVO has become 20 years old. The dynamic market of Kazakhstan once again gathers friends! International Exhibition «WorldFood Kazakhstan», which will be held in the exhibition center"Atakent" in Almaty, in Hall 11, from 6 to 9 November 2012, will be a platform for sharing experiences and demonstrate the achievements and innovations in the poultry industry. For years, Agrovo involved in this show and every year the number of business meetings growing. Projects for the renovation and building of new poultry farms in Kazakhstan are accelerating. Our feeling that many poultry farms turn to our company for implementation of the latest innovations and global experience in the field of poultry cause a feeling of pride and enthusiasm. So not to lower the bar we have planned a series of meetings. We will be happy to meet with you at the show at our booth! The only international exhibition in the Ukraine, which is fully devoted to animal breeding and poultry, including all kinds of fields of these industries. Agrovo, which has a large number of customers in Ukraine could not avoid its attention such a significant event. For several years, we have participated in the exhibition and will be happy to meet again our old friends, as well as new ones. It will be held fromOctober 31 to November 2, 2012, in Kiev International Exhibition Centre and we will be glad to see you at our booth number C-05! The show that determine the development of poultry in Russia and the CIS. This exhibition "AgroProdMash-2012", held in Moscow, at "Expocentre" from 8 to 12 October 2012. Agrovo, being a leader in the field of complex solutions for grading and packing of eggs, traditionally takes part in it and will be glad to see you at our booth No. 22C75, located in the second hall of the pavilion No.2. "Cereals - Mixed Feed - Veterinary 2013"
In June this year, the efforts of the CEO "Agrovo" Mr. Michael Langeder was organized visit of the Austrian Society of Poultry Breeders, the Austrian Society for processors of poultry meat and some Austrian businessmen sphere of poultry to Russia.